These newly renovated, clean vacation/corporate townhouses feature two bedrooms, comfortable beds, modern design and furniture. Each unit has two televisions, a DVD player, linens and a fully stocked kitchen. We also provide a stackable washer/dryer combo, dishwasher, microwave and two portable air conditioners. 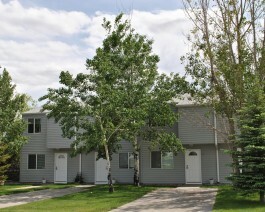 The townhouses are located within walking or biking distance to downtown Cody, the recreation center, and much more. Open year-round. No pets or smoking.